I’m currently in Santa Rosa Beach with Elle (& her family + dog)! It’s absolutely gorgeous here – yesterday I woke up early, threw on this adorable faux leather romper from Express & ran out to show John around this area (Rosemary, Watercolor, etc.) He’s never been here before so I had to show it off. This was actually John’s ‘weekend’ so he just flew in for 2 nights because his sister lives in Florida also & just had twins so we got to meet those angel babies. It was so fun! Anyway, I mentioned this romper (shorts version here) because I just discovered that Express has an amazing new line called ‘edition’ that has stunning pieces made of luxury fabrics & are hand designed. The items in the Edition collection are very unique & so classy. Thanks to Express for sponsoring this post. You are stunning! Love these pics and that romper! 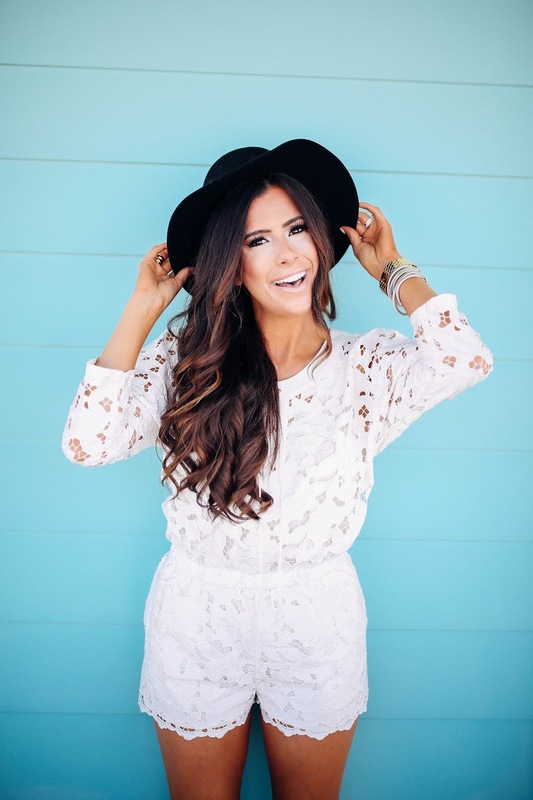 I totally love your blogs..�� You are SO Gorgeous! I love that romper! It looks so good against your tan! Hope you're having a lovely time! Love this look! It's so feminine and stylish!! Elle's pup is so cute! 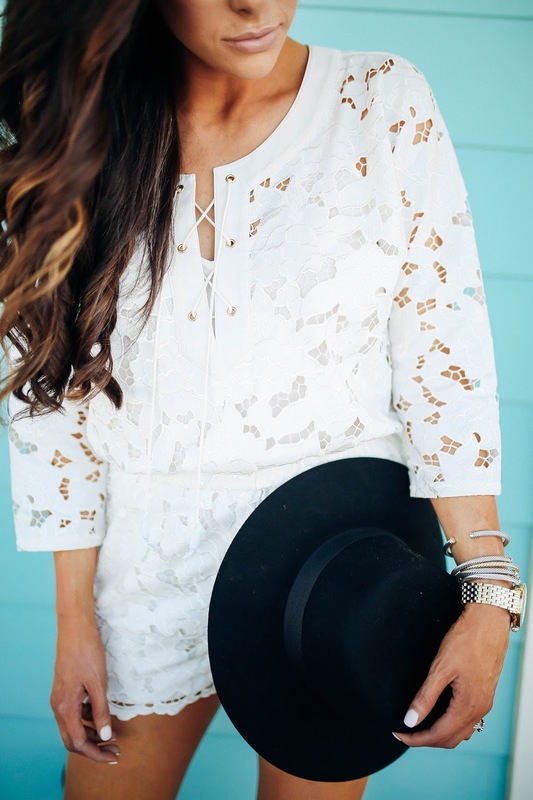 Love that white romper I need to check out that new express line! you look stunning in this post! Looks like such a gorgeous area. Have fun! Your dog seems so cute!! I absolutely adore your playsuit as well! I love the details of your romper! Beautiful photos! I am so glad I found your blog. Your style is great! You are so very pretty! This romper is perfection !!! Love love your style ! So, so cute!!!! I love everything about this! Such a fun look. You look adorable. Quick Question! Have you made a post about your tanning favorites and if you find certain things work better than others? I'd love to see a post! Gorgeous Emily!! This beach looks magical and love this outfit and your hair! Um this romper is AH-mazing!!! I wouldn't have never guessed it was from Express. Express stuff is usually too simple for me, but this romper is right up my alley! LOVE!! I love your sandals, and as always, I love your curls! I've been wanting the clutch since last year! Should I bite the bullet and get it?! Do you think it is practical? It's definitely a statement as well as a conversation piece! You look amazing as usual! I'm so excited that you and Alex met up on your trips! Two of my favorite content creators on one snap story, doesn't get any better than that! You look so dark in this post. What do you use for your tanning routine? That romper is really cute! Beautiful outfit. Love this post!! You look gorgeous! Love your hair and outfit.